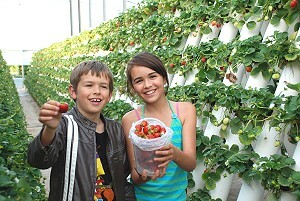 Ricardoes Tomatoes & Strawberries - Port Maquarie's Best Tourist Attraction! 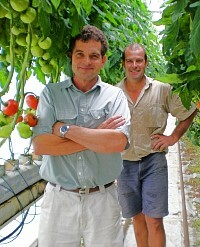 Ricardoes Tomatoes & Strawberries is located just ten minutes north of Port Macquarie on the Mid North Coast of NSW. State of the art computerised technology controls two acres of greenhouses and produces high quality hydroponically grown tomatoes & Strawberries, which contols irrigation, nutrient application, humidity, temperature, light, insect and disease control. 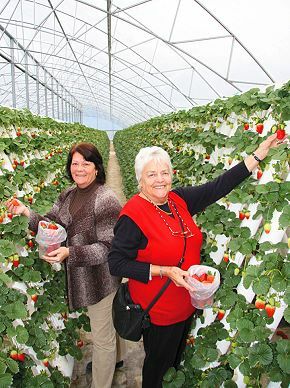 Ricardoes Tomatoes & Strawberries pride themselves on being an environmentally friendly farm. Call in to Ricardoes Tomatoes & Strawberries and experience the pleasure of picking your own plump, luscious strawberries. Ricardoes boast 5 varieties of hydroponic strawberries, with over 30,000 plants growing in their greenhouse, and that is in addition to the 8 varieties of tomatoes they grow. Ricardoes Tomatoes & Strawberries really taste the way nature intended, and the Sarks brothers who own the farm work hard to ensure that all the tomatoes & strawberries are given extra special care during the growing process, which is essential to achieve year round production and offer the best quality fruit. "We've found parents and kids enjoy working along the rows together, the parents picking berries from along the top of the vines, just above head height, while the kids work along the lower vines ferreting out the reddest berries between the leaves and competing with each other for the reddest and juiciest finds. "The comment from visitors is that Ricardoes is a great day out for families, offering the chance to while away several pleasant hours in a fresh food experience as well as enjoy a healthy, modestly-priced lunch and shop for pasta sauce and jam for the home, and thoughtful, well-priced gifts for friends or for special occasions. "You can come out here and not only see how the strawberries and tomatoes are being grown, but then you can go off and pick your own strawberries," Richard Sarks said. There are large, juicy, fruity, easy-to-find and easy-to-pick strawberries ready for your bucket. The great news is that entry is FREE and you pay for only what you pick.